Data driven marketing. No longer relying on gut feelings and what we think should work but rather relying on data about our customers and campaigns to drive marketing investment. The technology stack that enables this to happen though comes at a cost, and not just in the technology investment. The platforms and tools we use to evaluate user behavior, A/B test, assess campaign effectiveness, and build audiences across platforms all rely on tags placed on our website. These tags are snippets of code that execute in the browser and add an additional burden on our user’s browsers to run. The result is a potential for slower page performance and poor user experience. And how can an organization ensure that they are getting maximum data collection and value from their marketing and advertising technology stack while minimizing any performance risks associated with the platforms? 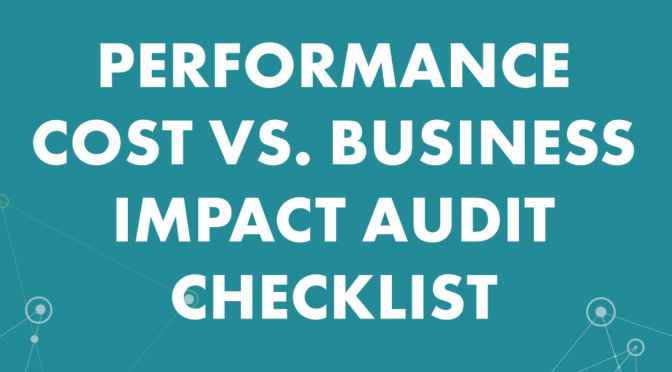 Fill out the form to download and follow the 6 step Performance Cost vs. Impact auditing process!